After reading these reason why people are eating at home more, I would respond to this survey by saying "All of the Above!" Additionally, I can eat more food that is locally grown, organic, and sustainably raised, plus I always eat a wider variety and larger portions of vegetables at home. (1) I was recently in a restaurant where my younger son asked the waitress if the salmon was farm-raised or wild-caught Alaskan. The blank look on her face and non-answer led my son to the likely answer to his question. (2) To this same restaurant's credit, they did serve their fish on a large bed of fresh kale. Even my nieces and nephews know that I love kale and eat the kale that is placed on the plate for decoration. However, one of them told me that he wonders if it has actually been washed since it not intended to be consumed. Oh, how sad is that. :-( Golly, I sure hope the kale has been washed, but then again, it certainly would be washed and intended to be eaten if I were serving it at home. (3) I ordered lentil soup (yea - a vegetarian soup in a restauant!) that was a huge disappointment, as I could actually taste the added salt, which is a obvious clue that too much has been added to the recipe. 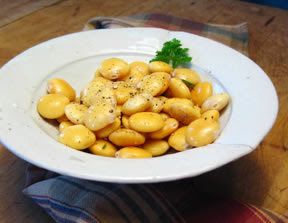 In fact, most restaurant food has a very high salt content even though it is difficult to actually taste. Because of the damage my heart has sustained from various cancer therapies, I need to limit my salt intake to prevent fluid retention and thus extra work for my heart. So rather than fuss or throw this soup away, I did take it home and use it in a future recipe (will post at a later date). 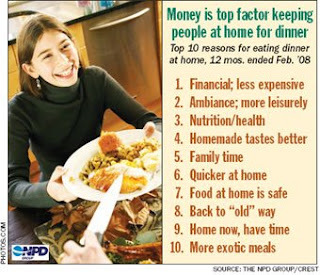 Are you eating at home more these days? What reasons have led to this change? Are you enjoying trying new foods, eating more leisurely, cooking more? 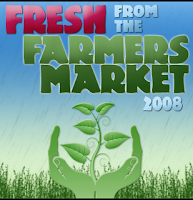 I hope you take the time to get down to your local Farmers' Markets to meet your farmers and purchase their fresh produce to eat at home. Let us give thanks for the food we are about to eat. And sustains us through our labors and rest. Did you know that Michigan is the "Asparagus Capital of the World"? I'm sure it is grown elsewhere, too, but if you have not grown your own or cannot find some locally grown at your Farmer's Market, look for some to buy in your local grocery store that was Michigan-grown. We talked about experimenting with freezing some asparagus to enjoy during the winter months (I have never eaten canned asparagus that was worth the effort). However, I admit to enjoying "the wait", the anticipation of waiting until the ground has warmed up the roots enough to send up this most unusual vegetable. After all, we waited the two years as recommended after planting and nurturing the roots before harvesting our own crop. One of the ways that I got myself through chemotherapy both times was planning and looking forward to various activities, again, enjoying the anticipation of the delight after the waiting, rather than complaining or wringing my hands over the necessity of "the wait". So maybe we won't bother with freezing any asparagus, but just enjoy (even pig-out) while we have it in abundance during the all too short spring in Michigan. Asparagus is one of the foods that are considered excellent sources of folate, one of the water-soluble B vitamins so necessary to overall good health. Enjoy the freshness of springtime in every delectable bite! I inform thee that I intend to eat thee. and may I never be clumsy! I ask this of thee, Sunflower-Root. Thou are the greatest of all in mystery. One of my blog readers made the comment that she does not like the word "diet", although she likes the foods I recommend. I agree, I agree!! Unfortunately, our society has morphed the word diet into a huge money-making industry based on disordered eating. How sad is that. There is even a Garfield cartoon showing him prostate before his food bowl, holding up a piece of lettuce and saying "Diet is die with a t". That is not how I like to think of the word diet or my life! (2) A way of living or thinking. Ahhh, what a more normal and comfortable use of the word, so enlarged and all-encompassing, not so narrow and restricted and leaving one feeling deprived. These uses of the word diet lead to health and wellness, including both the body and soul. you never know when the world will need you." Anyone who has been reading my blog for a while has come to realize that I am just crazy about eating kale. We do have our kale already planted in the garden, hoping for a early summer crop before it gets too hot. In addition, we have one small kale plant that we apparently didn't see to pick last November and was hardy enough to winter over, even during our long, cold, and snowy winter this year. (Ann Arbor just finished its snowiest winter on record, including setting a record for the most snow in March!). That one small plant is being "babied" along (meaning being careful about keeping our dog from stepping on it when she is in the garden with us as we are planting and weeding), as I have read that those are the plants that will quickly go to seed, thus giving us "free seed" for our fall planting - yea! Well, surprise, surprise when the mail was delivered today, I received a large envelope that was squishy. There was no return address, but it was postmarked in Montpelier, VT. Although I have heard Montpelier is a great place to live, to my knowledge I don't know anyone who lives there. The envelope contained a T-shirt that said "Eat More Kale" and a few of the cute green stickers shown above. That's all, no note, etc! It only took a few seconds to find the likely source of my new T-shirt. Check out the web site called Eatmorekale.com by Bo, the Eat More Kale Guy. What fun!! I do love people who also love kale, but maybe even more importantly, I love the fact that Bo has found an outlet for combining his thoughts and creative talents. He obviously loves what he does, and obviously many many other people love what he does, too! And flowers of many colors -- and grass. Yes, spring has sprung. We have finally cut our grass. Do Cancer Survivors Make Suggested Lifestyle Changes? * Only 14–19% of cancer survivors were eating five servings per day of fruit and vegetables. * Physical activity recommendations were met by 29–47% of cancer survivors. * Smoking cessation was met by 82–91% of cancer survivors. * Overall, only 5% of survivors met all three of the recommendations. to find, sort through, prioritize, and make all the necessary diet and lifestyle changes completely on their own to optimize the disease process and quality of life from that point forward? community expects most cancer survivors to "do this on their own"
cardiac community provides for continuity of care for their patients. before the diagnosis for multiple reasons. With so much else weighing on you, distracting you, and/or needing immediate attention (like figuring out how to sort through the medical insurance info - if you're lucky enough to have insurance - and figure out how to pay for everything else not covered by insurance, just for starters!! ), I think it is abundantly clear that cancer survivors are not going to jump on the health bandwagon quickly or easily, and it is unreasonable to expect them to "stop smoking, eat right, and exercise" completely on their own. pro-actively into comprehensive cancer care. Cancer patients need "oncology rehab" as much as people with cardiac disease and diabetes do (and I sure I could add other diagnoses here, too). An upcoming article to be published in Environmental Science & Technology Journal will present data that show the choice of food eaten can significantly reduce or increase a family's household impact on climate change. Carnegie Mellon researchers Christopher L. Weber and H. Scott Matthews article expands the perspective of the question asking if reducing "food miles", i.e., consuming locally grown foods versus those transported in from afar, decreases greenhouse gas emissions and thus reduces an individual's and/or family's food-related contributions to global warming. Their analysis shows that the transportation involved with the distance that food travels produces only around 11% of the average American household's food-related greenhouse gas emissions. They do agree that fruit, vegetables, meat and milk produced closer to home require fewer petroleum-based transport miles than foods brought cross country (or from the other side of the world!) to your table, however, their analysis demonstrates that the large amount of greenhouse gas emissions involved with producing the food matters more than the distance traveled. "Where you get your food from (i.e., where it is grown) is a relevant factor in family food decisions, but what you are eating - and the greenhouse gas emitting processes needed to grow it - is much more important from a climate change perspective,'' said Matthews, associate professor of civil and environmental engineering and engineering and public policy at Carnegie Mellon. The beautiful graphic I used here came from the blog called A Veggie Venture, which has compiled a seemingly endless number of delicious and exciting vegetable recipes (yes, I really do get excited looking at and eating beautiful vegetables!). One more final thought to consider. A colleague recently reminded me of this Japanese phrase concerning both healthy eating habits and lifestyle. It means to eat until only 80% full to allow space in one's life. Hmmmmm, I like thinking about the space in my life image. :-) Is this more physical space, i.e., in my stomach or getting those closets and rooms finally cleaned out, space within each day (i.e. time), more days in my life span, or what? What does more space in your life mean to you?